Is Jack Frost nipping at your nose? Warm up with a white hot chocolate. 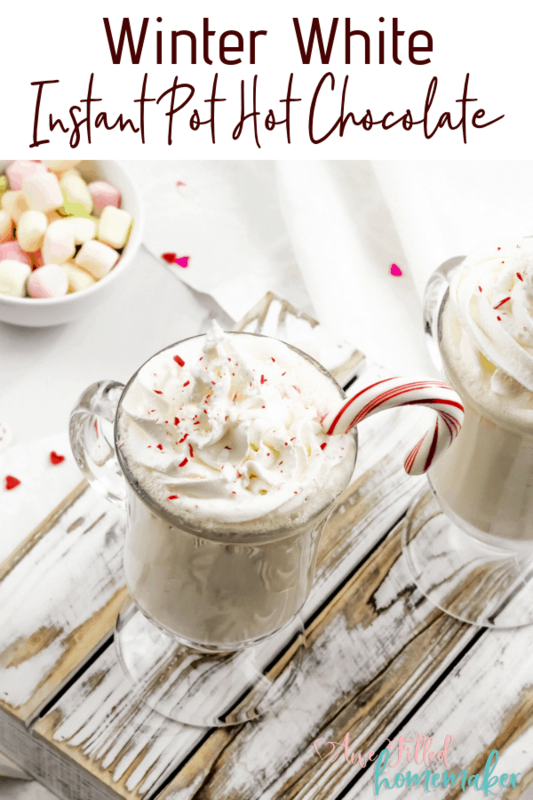 I have one stunning Winter White Instant Pot Hot Chocolate recipe that is luxurious, smooth and creamy. If you enjoy white hot chocolate, this is probably one of the best white hot chocolate recipes we have ever made. If you’re a traditionalist, try my World’s Best Hot Chocolate! 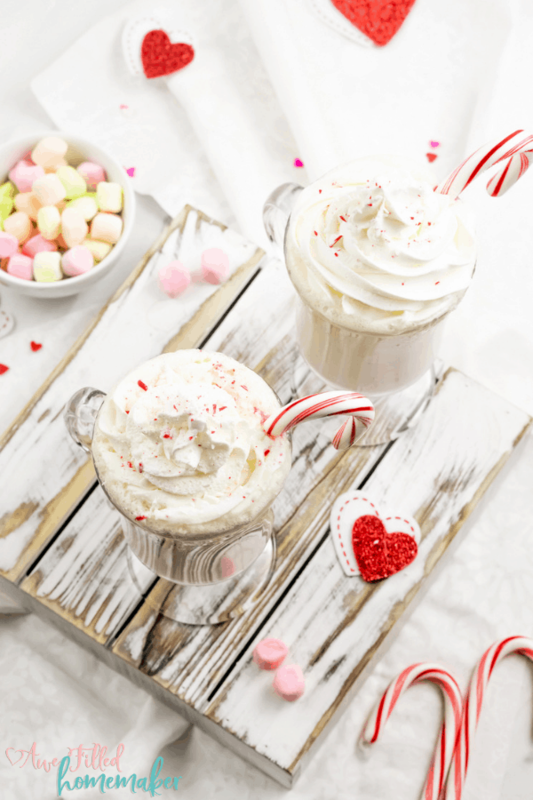 Dress up your White Instant Pot Hot Chocolate with a colorful candy cane to add a taste of peppermint when you dip it into your hot chocolate! 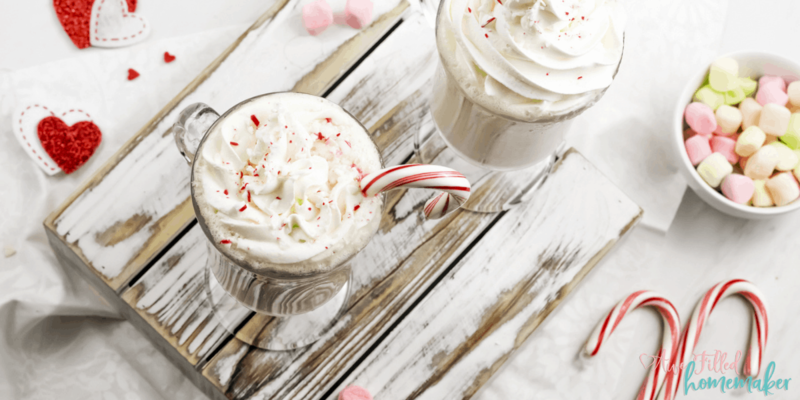 I am all about the peppermint and hot chocolate flavors, it is the perfect combination. Not only does this recipe have presentation appeal, it is silky smooth in flavor. Since purchasing my Instant Pot, I’ve been testing its limits with countless recipes. I decided to continue to test the durability of this magic gadget with my Winter White Hot Chocolate recipe. I like the fact the Instant Pot gives me the ability to toss in the ingredients, push a button or two and walk away while the Instant Pot does the work. I have made this recipe on the stove top for years, but it required a lot of stirring and babysitting along the way. With the pressure cooker, I’m free to take care of other tasks. The Instant Pot locks in the flavors that appeases the taste buds with a low and slow simmered taste. 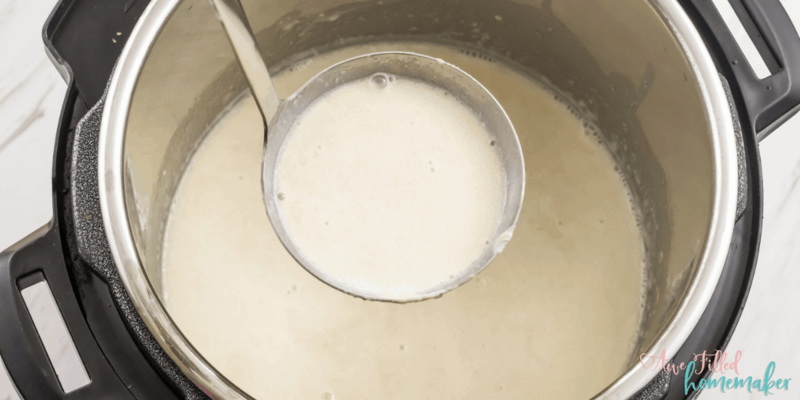 If you are planning on entertaining this holiday season, consider this white hot chocolate. 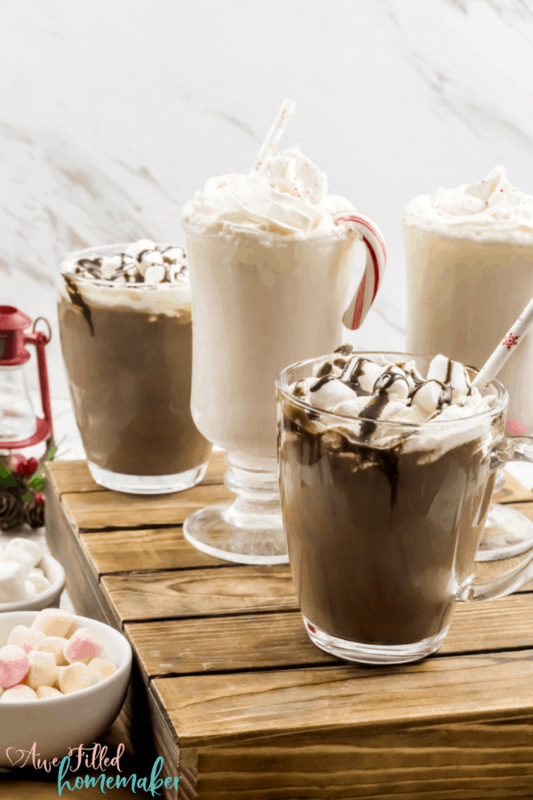 Serve this recipe in mugs with colorful straws, whipped cream and candy canes for an amazing presentation. This is always a fun way to serve holiday beverages. 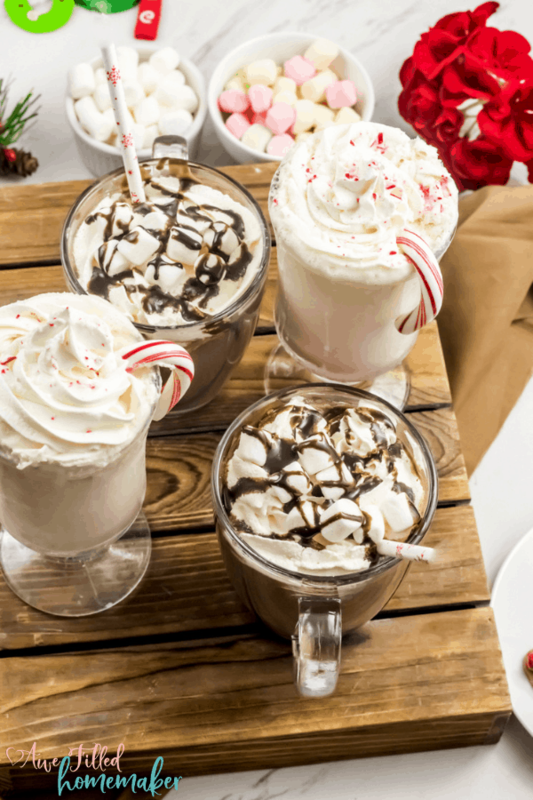 When I entertain family and friends during the holidays, I like to have a hot chocolate bar available with white hot chocolate, regular hot chocolate and some fixings, such as chocolate chips, crushed graham crackers, peppermint sticks, caramel sauce, candy canes and miniature marshmallows to let people dress up their drinks. Everyone goes nuts for a good homemade hot chocolate recipe! What if the holidays have passed and you’re just now stumbling upon this recipe? What if you have a bunch of leftover candy canes? Last year, I ended up with BOXES of candy canes when my oldest son came home with thanks to my oldest. Last year, my oldest son was came home with BOXES of candy canes after a Christmas party he attended with his troop! Sigh. If you have candy canes lying around and don’t know what to do with them besides relocating them to the trash can, I have the perfect use for them in this recipe! After we found out my youngest son had a severe soy allergy, I’ve been going out of my way to recreate soy free recipes so he didn’t miss out on his favorite treats. This recipe is soy free. It is also nut free and gluten-free. If you have a dairy allergy in your home, reach for coconut milk to replace the dairy milk, use cream of coconut in place of the half and half, and purchase dairy free chocolate. Even with the modifications to meet allergy needs, this recipe is outstanding in flavor. 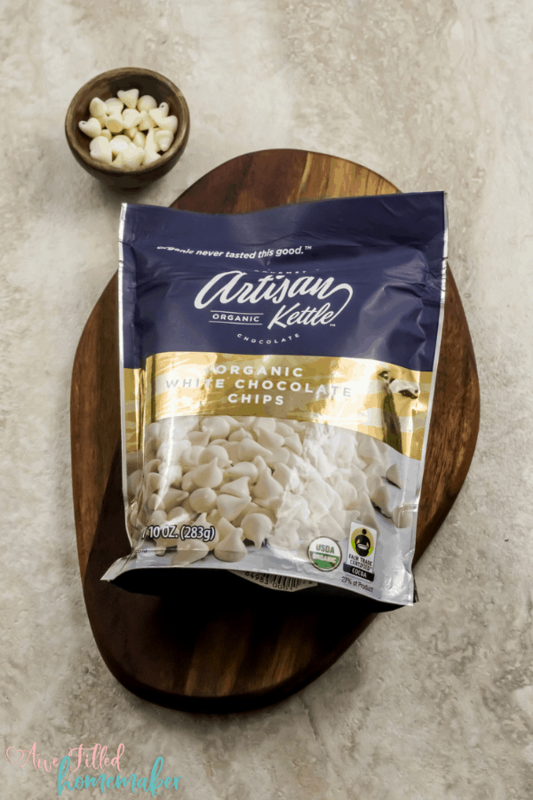 If you don’t need to use soy free chocolate, reach for regular white chocolate chips. This recipe is versatile and will work with either white chocolate, milk chocolate or dark chocolate chips. Whipped Cream, Marshmallow and Chocolate Sauce to Garnish (optional). TIP: For this recipe I used candy canes. However, the Chocolate Sauce is optional. Make sure that the kind you use is soy free, though. COOPS MICROCREAMERY Vegan Fudge Sauce, found on Amazon, is soy free. 1) In the Instant Pot insert, combine the milk, half and half, sugar, vanilla extract and the white chocolate chips. Give it a good mix. 2) Attach the lid ensuring the pressure valve is in the “Sealing” position. 3) Select the “Pressure Cook” mode. 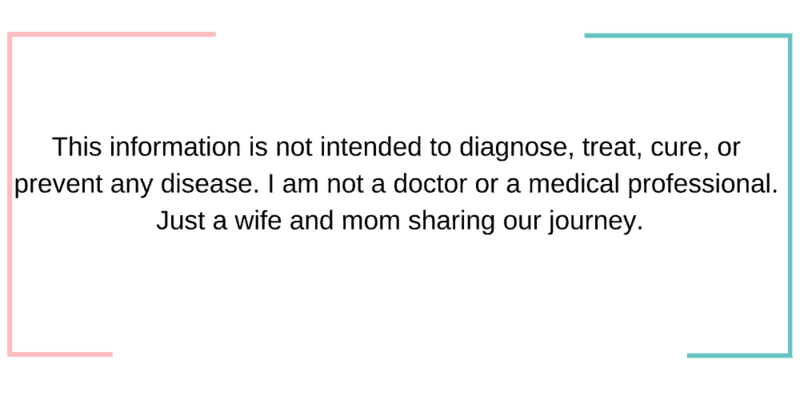 Adjust the “Pressure Level” to “Low” and adjust the time, with the “- / +” to 5 minutes. 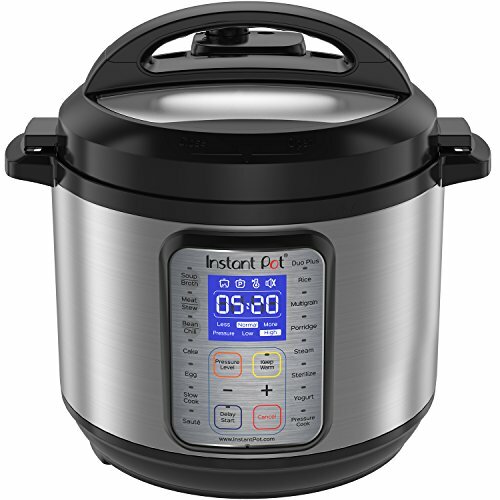 4) When Instant Pot beeps, let the pressure release the natural way for 2 minutes. I like using the spoon that came with the Instant Pot to turn the pressure valve to “Venting” position to do the quick release. 5) Give the Winter White Instant Pot Hot Chocolate a good stir and serve into four cups. 6) Top with fresh whipped cream, marshmallows, candy canes and/or a drizzle of chocolate sauce. To make it dairy free, use coconut milk and a can of coconut cream and dairy free chocolate chips. I wanted to create a white hot chocolate that would meet the needs for our family. 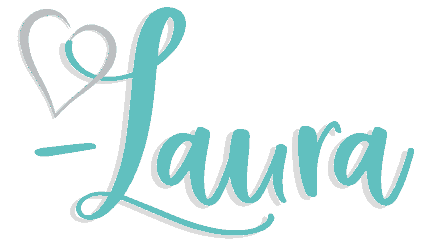 I know how hard it can be to find a good recipe that fits all our allergy needs, so my goal is to really work hard at creating great recipes that you know and love, but are gluten-free, soy free, nut free, and even some dairy free recipes. 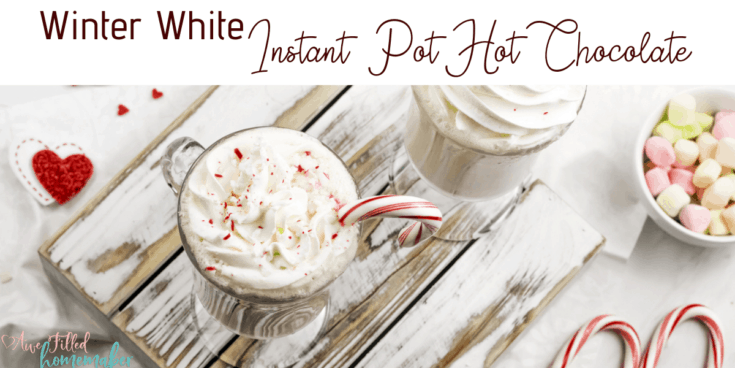 That about finishes up this Winter White Hot Chocolate Instant Pot recipe. I know you all will really love this recipe. We have already made it a few times this year and as the snow begins to fall and winter fully sets in, this recipe will be on speed dial in our home. This recipe is excellent for parties, holiday entertaining, and a cozy drink for those nights you just want to spend indoors. Enjoy and let me know what you think below! Also, in case you missed it, I also made an Instant Pot Dark Hot Chocolate that is not only delicious, but also SOY FREE! Here they are together. Try not to drool…..too much. Beautiful, healthier and delicious! Enjoy! 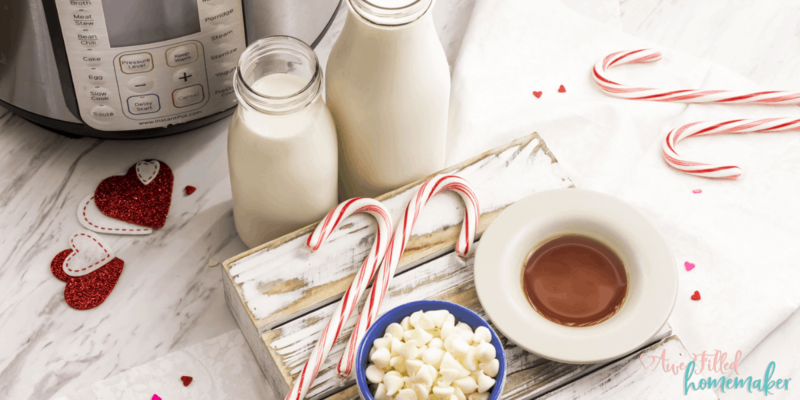 Dress up your White Instant Pot Hot Chocolate with a colorful candy cane to add a taste of peppermint when you dip it into your hot chocolate! 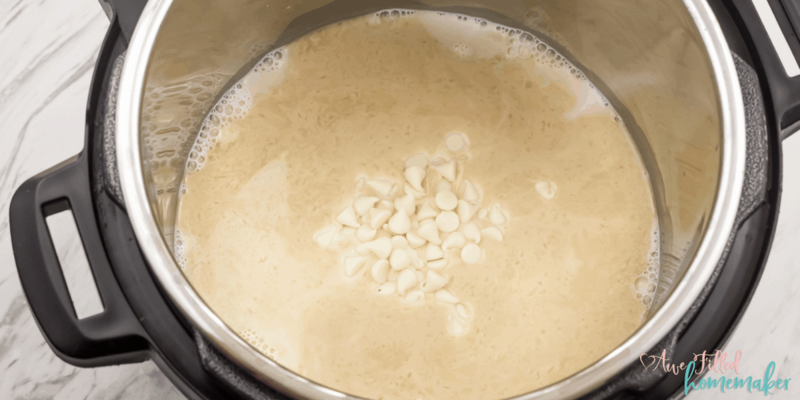 In the Instant Pot insert, combine the milk, half and half, sugar, vanilla extract and the white chocolate chips. Give it a good mix. Put the lid on, making sure that the pressure valve is in the “Sealing” position. Select the “Pressure Cook” mode. Adjust the ‘Pressure Level’ to “Low” and adjust the time, with the “- / +” to 5 minutes. When Instant Pot beeps, let the pressure release the natural way for 2 minutes and then I like using the spoon that came with the instant pot, turn the pressure valve to “Venting” position to do the quick release. Give the hot chocolate a good stir and serve into four cups. 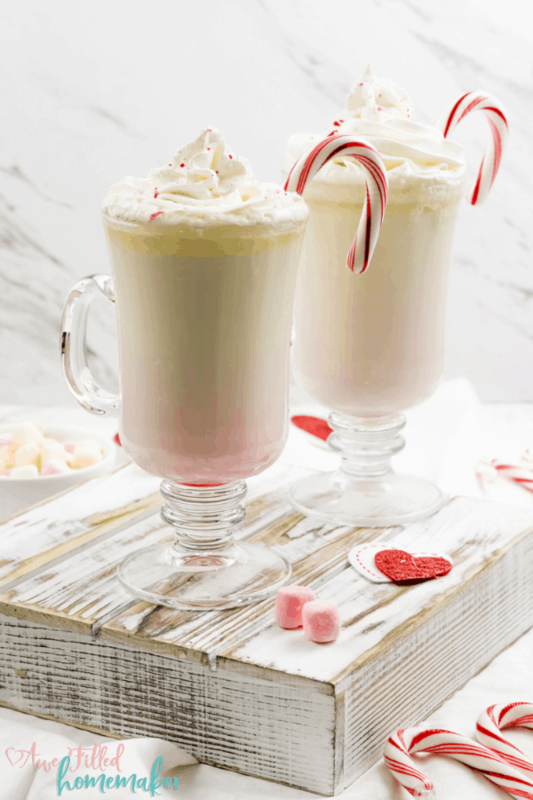 Top with fresh whipped cream, a sprinkle of crushed candy cane, marshmallows and large candy cane. To make it dairy free use coconut milk and a can of coconut cream and dairy free chocolate chips.